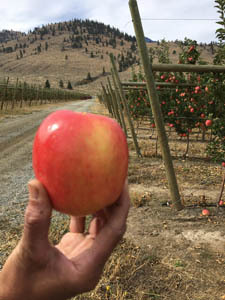 The orchardists in the South Okanagan and Similkameen Valleys have started to pick Ambrosia apples. Pickers are already carefully pulling Ambrosia apples off the trees, putting them into their picking baskets and gingerly loading them into bins. It won’t be long before these bins make their way to the packinghouse and on to a store near you! In the North Okanagan, farmers are getting ready for harvest and expect to start picking next week. Harvest will continue for a few weeks as orchardists usually do two rounds of picking to ensure that only the best apples make their way to you. Orchardists are reporting that the crop this year is looking good. And, we’re hearing from some of them that the Ambrosia apples are normal to large this year which is great news for Ambrosia apple lovers! This is all despite the fact that much of the Valley was filled with smoke this summer. Adrian Arts from Kamla Orchards in Summerland says he thinks the smoke may have actually helped protect the apples from what was a very hot, dry summer. The smoke blocked the sun which decreased temperatures a bit. He’s happy with his Ambrosia apple crop this year. He reports they are beautifully coloured and have sized really well. And, he thinks he’ll be harvesting more apples this year than last year. That will keep him picking until after Thanksgiving. Further South in Cawston, things are looking equally good. Ambrosia grower, Railou Gill reports that his Ambrosia apples all have good colour and a perfect size. “Not too big, not too small,” he says. His harvest started earlier than Adrian’s because of how far South the farm is located. In fact, there aren’t many farms further South – Railou’s orchard is almost at the US border! 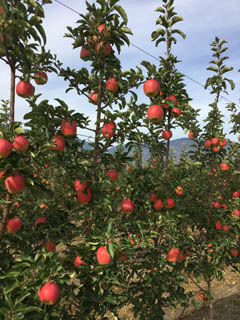 In between these two, in Penticton, Natalina Araujo says her Ambrosia apples are also a good size with good colour this year. “Ambrosia is always a good harvest, it’s so consistent,” she says. We wouldn’t be surprised to see her testing out her harvest by snacking as she picks because Ambrosia is her favourite apple. So, how can you get your hands on some just-picked BC Ambrosia apples? Ask your community grocer when they’re expecting their first shipment of BC Ambrosia. You can also expect to see them popping up at your local farmers’ market very soon. Or, find an orchard with a u-pick option or farm-gate market near you. There’s nothing better than biting into a fresh Ambrosia apple while standing in the orchard!